The Global Engagement Funds and Cities partnerships Programme will open for applications on 18 March 2019. The funding programmes, which are managed by the UCL Global Engagement Office (GEO), support UCL academics’ collaborations with colleagues overseas and are available for projects taking place in the 2019-20 academic year. 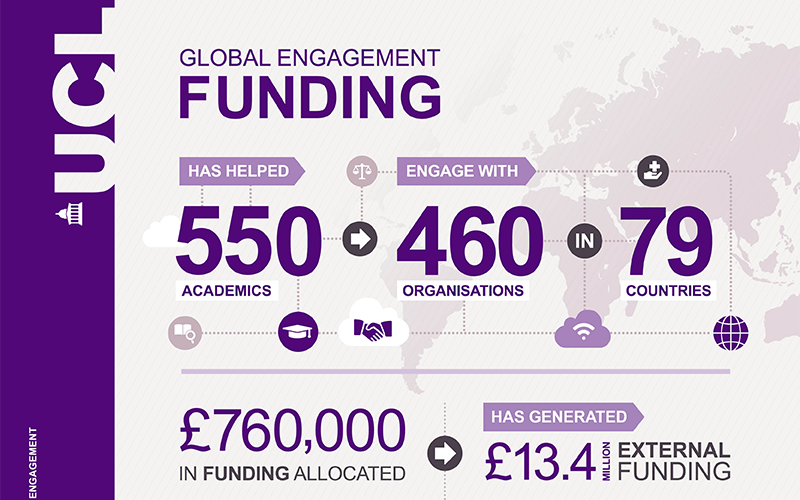 The Global Engagement Funds are led by UCL's network of Vice-Deans (International) and Pro-Vice-Provosts (Regional). Awards of up to £2,000 are available for academics to facilitate and accelerate activity with global partners, including other academics based at an international higher education institution, research institute, NGO/charity, governmental body or corporate entity. If your project is designed with partners in Rome or Paris, apply to the Cities partnerships Programme. This is a new UCL-wide initiative, which supports multidisciplinary academic work in major cities across the world. Beginning with Rome and Paris, it offers seed funding of up to £5,000 per project for collaborations with partners in these cities. Dr Florian Mussgnug from the School of European Languages, Culture & Society is Academic Director for activity in Rome and Dr Claire Colomb from The Bartlett School of Planning for Paris. In June, GEO will open applications for an academic director to propose a third city. You can submit applications for both the Global Engagement Funds and the Cities partnerships Programme, but the applications must be for different projects. Funding will not be awarded from both programmes for the same activity. Over the past three years, the funding has benefited more than 550 academics, supporting their engagement with 460 organisations in 79 countries worldwide. £760k of internal funding has leveraged more than £13.4m of external funding so far. Applications for the 2019-20 academic year open on Monday 18 March 2019 and close at midnight on 17 May 2019. For more information about either funding opportunity, please contact vpi.global@ucl.ac.uk.